We love water in a garden because its one of the basic elements of life… And it reminds us of a pleasant stream or idyllic pond, right in our own backyard space! 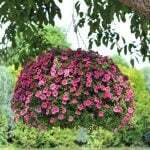 However, if you have a small garden, or simply don’t want to go to all the work of digging out an in ground water feature, DIY container water gardens are an easy and fun project. 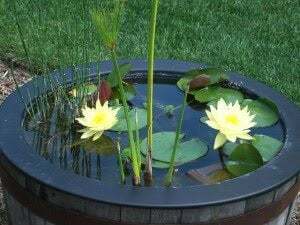 You can create a simple fountain, or grow pretty pond plants as well. Check out these projects perfect for any DIY gardener! 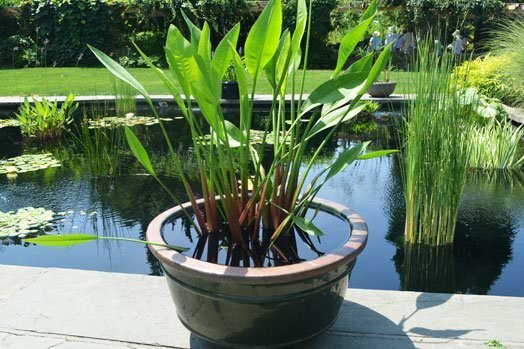 And if you need some help with what to plant in your new container, check out our post on pond plants. First we have a water garden from Vidya at ‘What’s Ur Home Story?’. 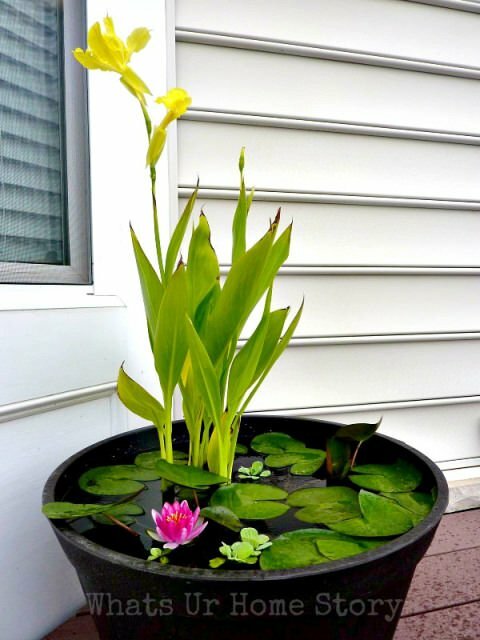 Her tutorial on her DIY container water garden lets you create this mini pond on any patio, and it’s easy! She tells you how to control mosquitos, and how to add fish as well. Her water lilies turned out so pretty! ‘Midwest Living‘ shows us how to make 3 easy container water gardens, complete with good explanations on how this little biosystem works. 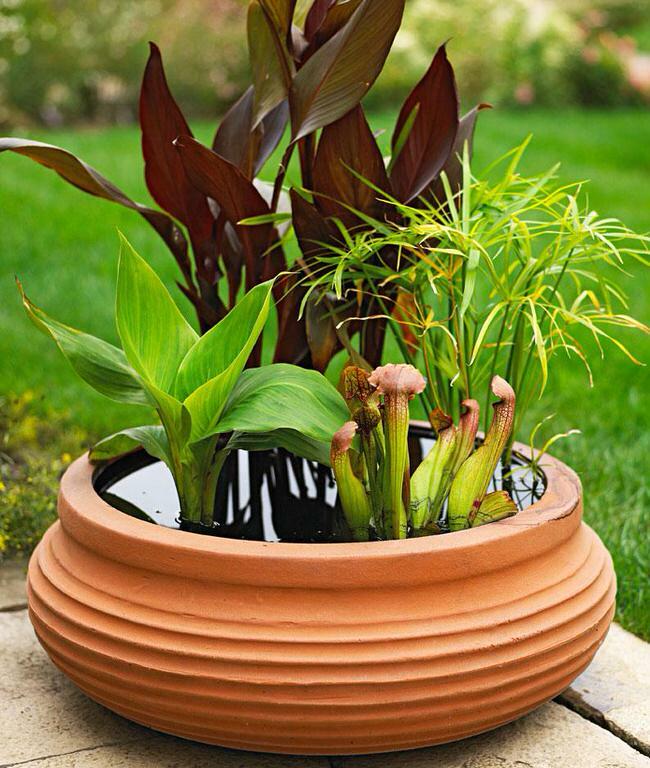 Don’t know where to get supplies for your DIY container water garden? 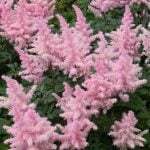 ‘Martha’ gives us her list of their favorite mail order companies for water plants and supplies. Your local public garden may put on free classes on creating a water garden, like this one at ‘Wave Hill‘ garden and cultural center in NY. 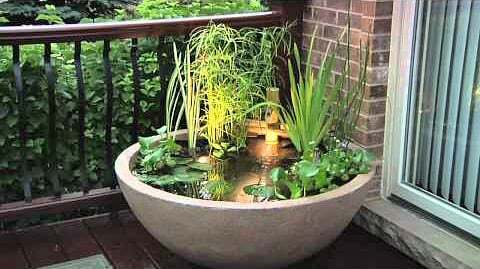 This pic is also a good example of keeping it simple… You don’t need a lot of different pond plants to make your container water garden work. Here is a great idea from ‘BJL Aquascapes‘… Use underwater lighting in your container garden and make it a perfect evening focal point! 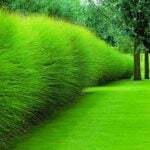 Even if you don’t spend much time in the garden after dark, if it can be seen indoors, it’s a great design element that looks high end for just a few dollars. 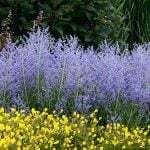 Check with local nurseries or online suppliers. 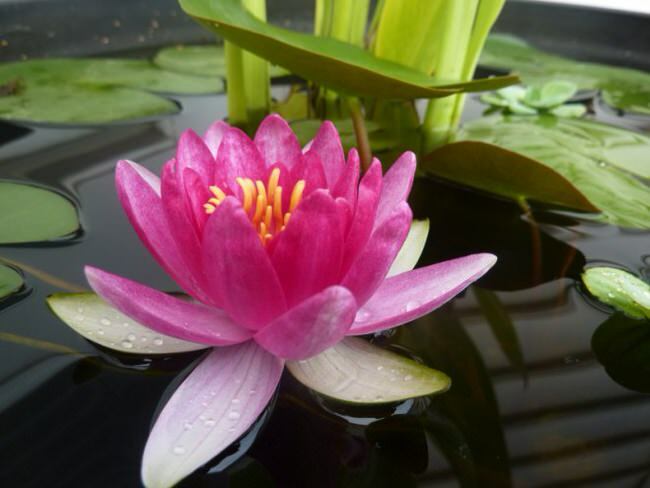 Lastly, if you want to grow the most desired water plants of all time, the water lily, then check out these tips from ‘Blue Lotus Farm‘! 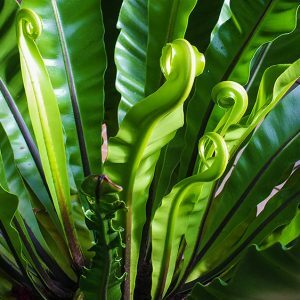 The tropical varieties are more expensive then the hardy ones, so don’t get discouraged if the first lilies you see at the nursery seem pricey. Definitely try one of these Easy DIY Container Water Gardens, and Pin your fav for later! We think you would also love our posts on DIY Soothing Garden Fountains and DIY Tabletop Fire Bowls! Also, check out our post on our sister site ‘OhMeOhMy’ all about Marimo Moss Balls. Raccoons ravaged my container water garden – ate the fish and plants! Are there covers that one could use at night? I know some pope create a cover with chicken wire that sits just below the water… Hope that helps! I’m a Michigan girl, what would I do in the cold season? Or would this be a redo every spring??? What do you do about mosquitos? The moving water from the pump discourages mosquitoes, but there are also mosquito control balls you can buy to float in the water. Great Ideas! I did a few of these last year, and they were a total hit! What is the simplistic way to make a small water garden for coye fish or if they are to hard an easier fish that is easy to maintain, small but still beautiful. I have a severe illness but would love sitting by a small little pond just watching the fish. I live in central Ilinois and can remember mr Grandmother just having a large oval in her yard that was cemented and she put pretty stones around it and did nothing else and the fish were always fine? 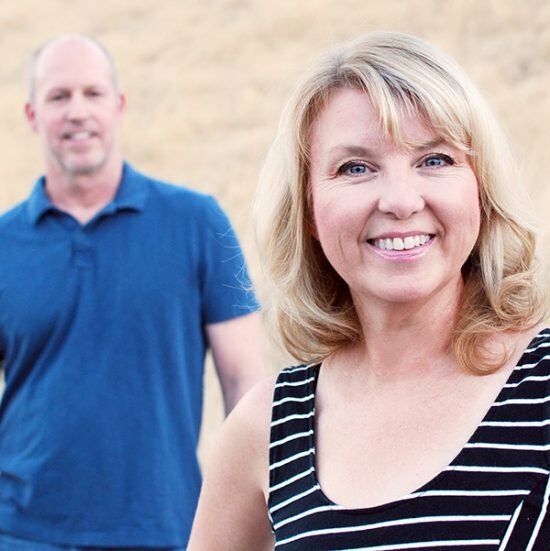 I’m 59 so back then she didn’t have a pump or anything so how did the thrive so well? It was always in the shade too. 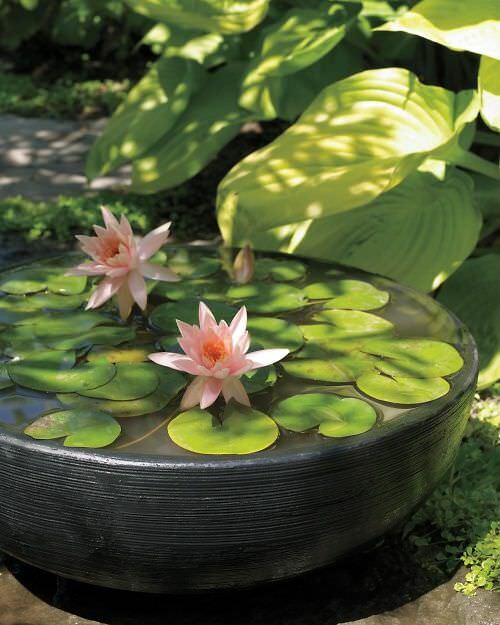 If they whole pond liner is cement, it would keep out the dirt, plant spores and bacteria that are so prevalent and they would probably do fine… You can also have a ceramic or concrete container with just one or two small goldfish in it! Hope this helps you! Keep in mind goldfish need at least 20 gallons per fish. Single tails (comets, shubunkin) need 30-50 gal per fish and koi should really not be in anything less than 100 gallons. Awesome. 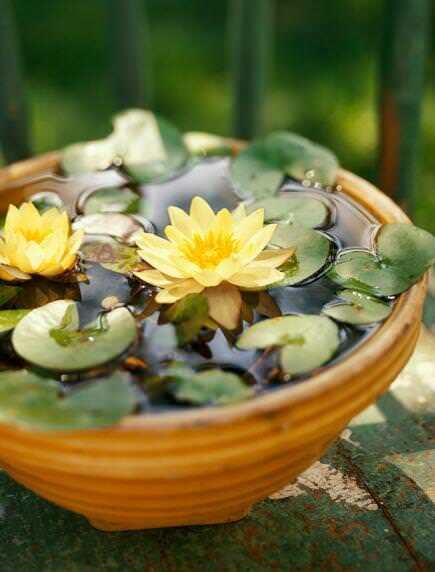 It’s not too hard to create but somehow we don’t have the such idea to create a small water garden like this. Thanks for sharing.